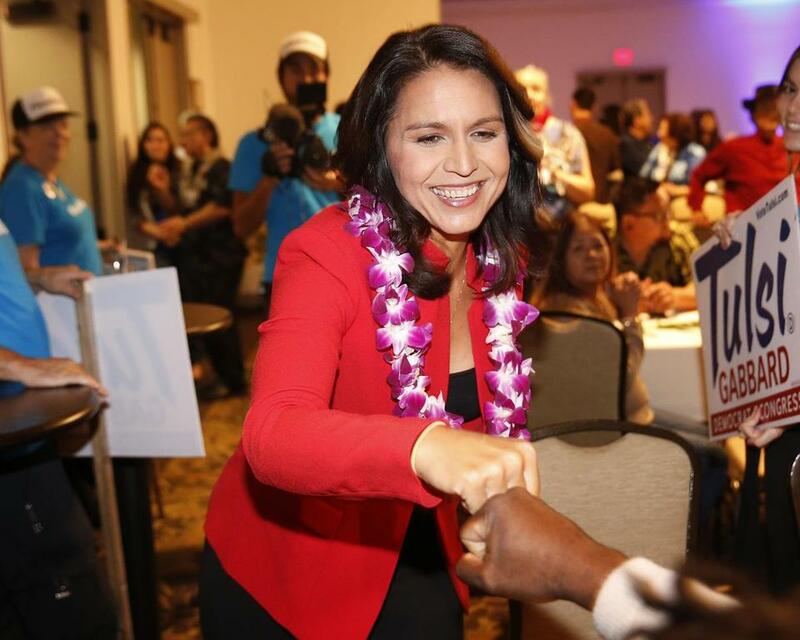 US Representative Tulsi Gabbard, a Hawaii Democract, greets supporters, Nov. 6, in Honolulu. Gabbard visited New Hampshire this week, reportedly testing a run for president. “Michael Bloomberg Sparks 2020 Presidential Rumors as He Appears in Iowa to Screen Climate Change Movie” . . . “Rep. Tulsi Gabbard Tests 2020 White House Run in New Hampshire” . . . “Iowa Democrats Say They Want Generational Change” . . . “O’Rourke Gets New Hampshire Invite as 2020 Buzz Grows.” And those are from just this week. The length of time the United States spends on presidential campaigns is unreal, unhealthy, and, for many of us, unbearable. No other nation puts itself through these two-year political marathons — in most democracies, national elections consume no more than a few months, and sometimes only weeks. Long before Election Day arrives, Americans routinely say they are fed up with the whole exhausting, irritating, trivializing ordeal. Is there a way out of this? Yes: Break the Iowa/New Hampshire duopoly. Pundits and politicos have bewailed the outsize influence of these two first-in-the-nation states for years. Because their voters get first crack at winnowing what is often a crowded field of White House hopefuls to the eventual party nominees, Iowa and New Hampshire typically set the tone for the entire primary season. Only one candidate in the past 40 years, Bill Clinton, has gone on to win the presidency after losing both states. One thing these possible 2020 presidential aspirants have in common? They’ve all got a 2018 Senate election. 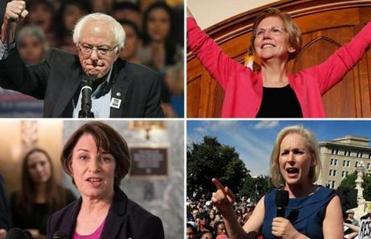 Bernie Sanders, Elizabeth Warren, Amy Klobuchar, and others are making the familiar moves of a candidate eyeing the White House. There’s just one thing they need to do first: Win reelection. The usual objection to allowing Iowa and New Hampshire to retain so much prominence is that they aren’t representative of the American electorate. Critics argue that both states are too small, too rural, too wealthy, and too white to deserve their first-in-the-nation perch. Maybe yes, maybe no — reasonable minds can debate how important it is that the first primary/caucus states be microcosms of the nation as a whole. two states always go first, candidates focus on them earlier — far earlier — than they should. They spend inordinate amounts of time in Iowa and New Hampshire, hiring staff and renting offices long before voters should have to be hectored about the next presidential election. Some candidates almost literally camp out in Iowa or New Hampshire for months. News organizations reinforce the political siege, deploying resources and reporters to concentrate on the two states. All this has the effect of pushing the campaign’s unofficial, but all too real, starting point further and further back. Every four years, the Republican and Democratic parties should hold a drawing to choose two different states to go to the head of the line. Limiting the drawing to, say, the 15 smallest states would preserve the traditional “retail” campaigning that voters and candidates prize in Iowa and New Hampshire. But — this is the crucial reform — the drawing should not take place until Jan. 1 of the presidential election year. With no way to know in advance which states would enjoy the first-in-the-nation turn in the sun, presidential hopefuls would no longer be able to overrun those states months before any votes were cast. Ambitious politicians would continue to seek publicity, build alliances, and raise money. But they would have no reason to begin intensive presidential campaigning — holding town hall meetings, marching in local parades, knocking on voters’ doors — almost as soon as the midterms were over. For candidates to focus closely on a couple of small states at the start of the electoral season is good discipline. There’s no reason, however, for those first-in-the-nation campaigns to last for eight or 10 months. Eight or 10 weeks is far better. Iowa and New Hampshire have had a good long run. But the time has come to end their duopoly, and make campaigns less awful.